Keto snacks are the best thing you can have on hand for yourself. 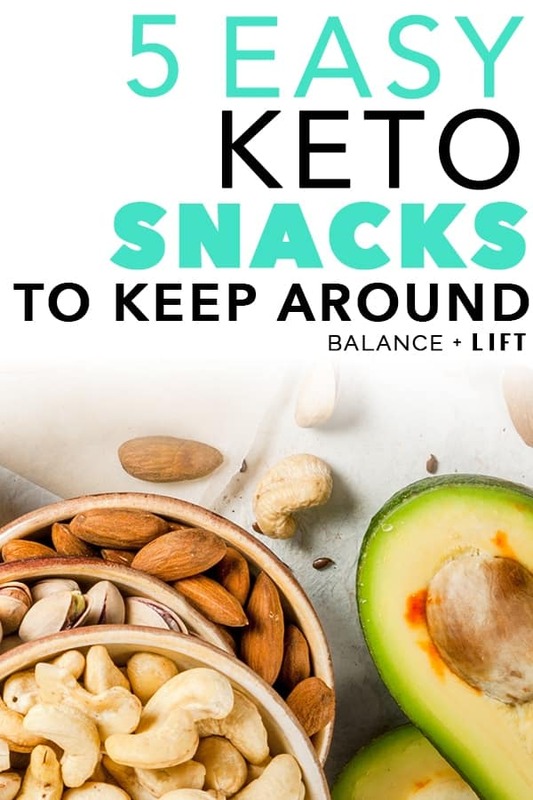 I'm still finding that I need to keep easy keto snacks with me at all times. There are sometimes when I just can't make a full-blown meal while I'm out on the go, so these snacks save the day. Don't worry if you can't carry around a lunch box with you. There are some pouches that you can find that help keeps items cool. Cheese is one of those things that needs to stay a little cool so it doesn't get melty. These right here have different patterns and are super cute. I have an order placed for my kids and then for myself too (because why do they just get to have fun haha). They're small but they pack a powerful punch. Avocados are loading with tons of fat, and even though their carb content is heavy the fiber count makes it the perfect snack. One avocado has roughly 29g of fat, 17g of carbs and 13g of fiber. That means that an entire avocado has roughly 4g of carbs. That's 4g net carbs for 29g of fat! That's outstanding. Boiled eggs are easy to tote around and easy to make. You can batch cook a ton of eggs for the week and they'll keep relatively well in the fridge. They have both fat and protein which will help satiate you and keep you full when you're having a bit of a hunger attack. You can up the fat content by drizzling an egg with olive oil and adding some salt and pepper to it. Alone, they have 5g of fat, 0.6g of carbs and 6g of protein. Talk about a tasty treat. I like Sargento® Colby-Jack Natural Cheese Sticks personally. They're easy. They're quick. You can toss them in your purse with some nuts or seeds and have a great snack. These particular ones have 7g of fat, less than 1g of carbs and 5g of protein. I try to get a new package of cheese sticks or string cheese when we go shopping. One package will usually last us about a week or more. It depends how much the kids are wanting cheese that week usually. These are by far probably my favorite snack food for living a keto life. They're delicious, contain fat, and satisfy my “chip” or “crunch” need. I love how easy it is to make them too! Seriously, you line a baking sheet with parchment paper, spoon out a tablespoon or so of cheese into piles and then bake until they're golden on top. Once they're cooled and dry they should be pretty crispy. At least, unless you're impatient like me. Then the edges might be crispy but the center might be a little flimsy. I'm ok with that sometimes. I just love them. You want to be careful though. Some pre-shredded parmesan can have some sort of carb as a coating on the shreds. Its supposed to keep them from sticking, but it's adding extra carbs you might want to look at. It's not a deal breaker for me, because I don't eat gobs of them. But, if you get a little carried away you just want to be aware of your carb intake. If you don't want to make them yourself then many companies have you covered. I've found quite a few that I like. Sometimes, if I'm near a Whole Foods, I'll grab two of their parm crisp containers. They're pretty tasty. Almonds, peanuts, cashews, walnuts, macadamia nuts… there are so many types of nuts that are full of really good fats. 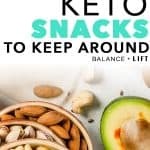 If you aren't sure which would be best to eat or what you might consider “ok” then check out this post by Perfect Keto. They list out a good many items and show their fat content, protein, and carbs (full carbs and net carbs). It's super handy and I reference it often. Though, I think my favorites are pumpkin seeds. I especially love being able to get a pumpkin in the fall and roast our own! So delicious. Sometimes it's really easy to get overwhelmed with trying to swap to a keto lifestyle. There are tons of rules, all your favorite foods are suddenly out of the question, there are even a lot of fruits you can't eat anymore. Don't get discouraged. There are tons of recipes out there for fat bombs. I'm going to link to a post that shows 21 different kinds of fat bombs you could make. But, I usually want to keep things simple, and if you're like me you could do something like this… I love peanut butter, so I make peanut butter fat bombs. I use coconut oil, butter, and peanut butter to create my fat bomb. But, my husband doesn't so I'm trying to find a fat bomb that he'll enjoy. I'm pretty sure it will involve chocolate. I need to explore some ideas though and test making a few different batches. If you're looking for different fat bombs to try, then check out this post here with 21 different kinds. If you were able to plan your meals out for the week, I hope you planned your snacks too. This will help you remember (at least we hope) so when you're packing your lunch or if you're working at home you'll know what snacks you have. Another easy trick is to put a piece of paper on your refrigerator door with a list of the keto friendly snacks you have at home. It's just a reminder of what you have so you can easily grab something. Previous Post: « Carb Cycling vs Carb Ups: Should You Carb Cycle or Carb Up?